Games coming bundled with other games in the same series has been a growing trend among recent titles on PS3: Dead Space 2 (DS: Extraction), Medal of Honor (MOH: Frontline), Assassin’s Creed: Revelations (Assassin’s Creed) and more. The newest installment of Twisted Metal will continue that trend, albeit with a voucher. David Jaffe, co-founder of Eat, Sleep, Play and Co-Director of the new installment of the car combat series, has announced that Twisted Metal for PS3 will come with a voucher to download Twisted Metal Black. The version of the game is the original version for PS2, not the online-enabled version that was released sometime later. Vouchers for TMB will be available with new copies of the game during its first printing. To see the announcement, click on the video below. Warning: This video contains an instance of NSFW language. 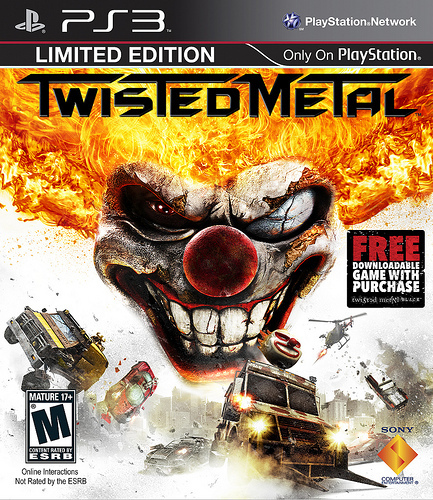 Twisted Metal will make its way to PS3s on Valentine’s Day of next year, February 14th, 2012.